Back by very popular demand is the Home of Metal Family Tree tea towel. 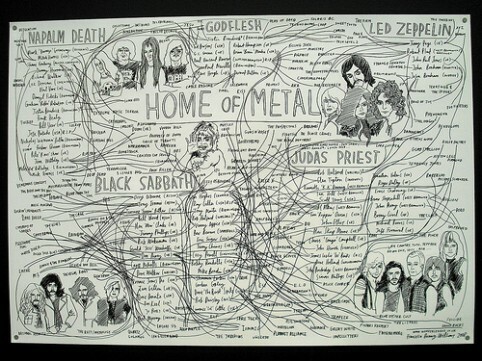 Illustrated by Bunny Bissoux, the map traces the tangled web of heavy metal history. A lovely Christmas present we reckon, but make sure you get your order in by Thursday 19th December at the latest. Visit our shop. Home of Metal is a celebration of the music that was born in the Black Country and Birmingham – check out, and contribute to, the digital archive.